I prepare lots of presentations for company executives, for lots of big events. The presentations are like mini-Hollywood productions: animations, photography, precise timing to coordinate with the speakers script, wide-screens, multiple screens (up to 160′ of screen! ), etc. But take a journey back in time and it is almost amazing to me what was high-tech and “unbelievable.” Click here to view Steve Jobs original keynote speach unvieling the Macintosh computer. Note: the computer display during the presentation is not connected to anything but shot with a camera that is projected. Yesterday I downloaded and installed the latest version of Perspector – version 3, which was released earlier this week. The update (from version 2) went smooth and in experimenting it is easy to see that it now has even even larger library of 3D elements and some really impressive charts. Check out all of the details at the Perspector website! Glen Miller, has some great tutorials and samples using Perspector. 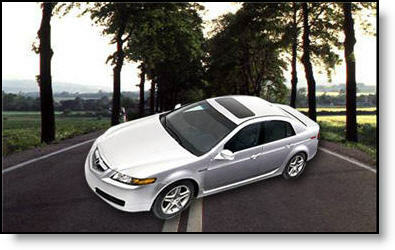 Click here to see some real world samples of Perspector in use. Yesterday was the official release of Office 2007 Beta 2. Anyone is free to download (for free) and see what all the news is about. Of course being a beta, not everything is working 100%, but the new User Interface has to be experienced as words cannot explain it sufficiently. Even more impressive is seeing the new charts and tables engine in action! The download is 550MB, so have a fast connection. Click here to go to Microsofts Beta download site (wait for the flash animation to finish and click the “Try Now” button). There are some great animation effects that can be achieved using the “Emphasis” animations. One of the more frustrating is the Grow/Shrink emphasis. I have a developed a two part tutorial to go into details on how best to use this animation effect. Download Part I here (1 MB PPT file). When creating presentations I spend a lot of time in PhotoShop. And a lot of that time is spent creating images with no background around the object so it can float anywhere on the PowerPoint slide. The TRIM feature in PhotoShop is invaluable – yet few designers have heard of it! (1) So you have an image like this. 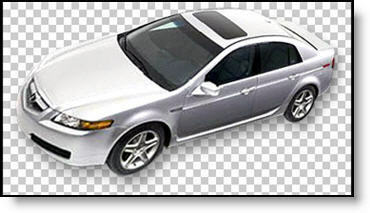 (2) You spend time in PhotoShop “cutting out” the image so it sits on a transparent background. (3) Now you are going to save it as a .png with transparency. But any space around the image is only going to make for a larger file size (it is transparent space, so you don’t need it, or want it). Enter the TRIM tool. 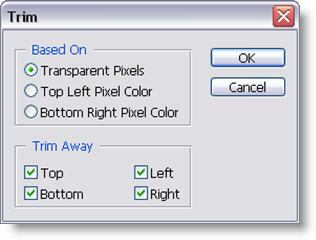 In Photoshop go to IMAGE >> TRIM. (4) Make sure the settings are like these. 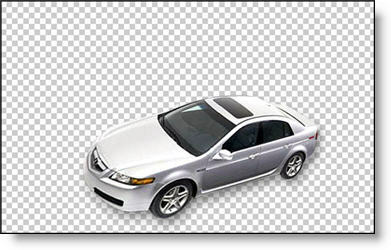 (5) PhotoShop will crop the image down to the exact pixel dimensions of the image! Now when you save the image as a .png with transparency you are assured of only saving the necessary file size! My friend, and fellow PowerPoint MVP, Geetesh over at Indezine just added a very good article on his website on what bitmap and vector graphics are. It is a very quick read and provides a good understanding of how these two formats vary, which is important when resizing images in a presentation. Click here to read it. I have one project in that involves tons of typesetting. The fine tuning of sentences that I much prefer to do in a desktop publishing application, or even MS Word; PowerPoint just does not have the tools to make this tedious task from being painful. BUT, Jensen Harris just yesterday made note of one tool being ported over to PowerPoint that will make these tasks a bit easier! The “Click and Type” tool found in MS Word will now be in all Office apps – and the at is good news! Check out the details at Jensen’s blog here. Here is a presentation that is a series of animated slides from a project where the speaker needed to explain the company’s medical process to a non-medical audience. We decided on developing an analogy of the various industry processes with something everyone is familiar with – airport security. As is typical for many of the presentations I work on, it is primarily 90% custom PhotoShop elements animated in PowerPoint. Download the presentation for review and inspiration. I have left it as an editable presentation for those that want to look at the animation timeline and techniques can do so. Click here to download (4.5 MB ). – Intel DuoCore, P4 or Centrino CPU (eg. not a celeron), I do not use AMD but the equivalents. – On video ram there is a big difference in shared vs. dedicated memory. For PowerPoint to playback animation, flash files, movies and even audio the computer really needs to have dedicated memory (this allows the use of the ‘Hardware Acceleration’ feature). It should be by ATI or Nvidia. desirable and you cannot have enough USB ports. Perhaps you have some custom picture bullets that you use ongoing. Never fear, there is a fairly easy way to organize your own collection. (1) Either create your own folder to contain the bullet images or use the Office default folder (see item #1 on 5-8-06 post). 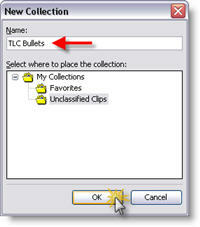 (3) Open the Clip Organizer (see item 3 on the 5-6-06 post) and go to FILE >> NEW COLLECTION. (4) Name the collection and click okay. (5) Select the new collection in the COLLECTION LIST column. Go to FILE >> CLIPS TO ORGANIZER >> ON MY OWN. (6) Repeat for all images in your personalized collection. 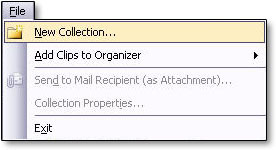 Note: You can use the >> CLIPS TO ORGANIZER >> AUTOMATICALLY to search the computer, then select the specific folder to add all new images at one time. (7) Now when you add Custom Picture Bullets to any presentation, your collection of bullets is available!